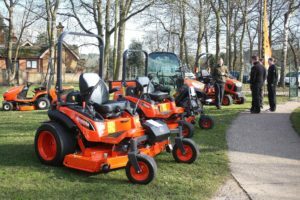 Kubota UK announces it has further strengthened its dealer network after joining forces with Staffordshire-based groundcare and arboriculture specialists Buxtons. The appointment of Buxtons is part of Kubota’s ongoing investment to ensure its market leading range of high performance groundcare machinery is supplied through an independent dealer network that is committed to a first class service offering. The new partnership means Buxtons will now supply Kubota’s complete range of high quality and innovative groundcare solutions, from walk behind, ride-on, out-front and zero turn mowers, to Kubota’s industry leading compact tractors and its durable and rugged RTV utility vehicles. This includes Kubota’s recently launched range of BX Series, B1 Series and B2 Series sub-compact tractors, and the new ZD1211 zero turn ride-on mower. Neale Hopley, managing director of Buxtons said: “We are absolutely delighted to become a Kubota dealer. Although we previously supplied groundcare equipment, our range was limited. This new relationship with Kubota enables us to significantly expand our business, giving us the chance to target a much wider range of commercial sectors including local authority, education, equestrian and the sports turf market. Adrian Langmead, business development manager for Kubota UK’s Groundcare Division said: “Here at Kubota we pride ourselves on having a dealership network that is second to none. By signing Buxtons up as a new dealer we can extend our reach across a 30-mile radius throughout the Staffordshire area, enabling us to secure key accounts within the commercial market. Buxtons has already received significant interest in Kubota’s machinery, securing a number of orders from both commercial and residential customers at its recent open day, which saw over 100 potential and current customers attend. For more information on Kubota and its extensive range of groundcare solutions visit www.kubota.co.uk or call 01844 268000.